Finally, after weeks of speculation and one notorious false start, Antonio Brown has been traded to the Oakland Raiders. The news first came from Brown himself on Twitter. Minutes later, the news was confirmed by Pro Football Talk. ESPN’s Adam Schefter later reported that Brown would receive a healthy raise from his new team, receiving $50.125 million over the next few years with incentives up to $54.125 million and $30.125 million guaranteed. That’s quite the upgrade from the $0 guaranteed he previously had. Per NFL Network’s Ian Rapoport, the Pittsburgh Steelers will receive a third- and fifth-round pick in the 2019 draft from Oakland. A deal that would have sent Brown to the Buffalo Bills was reportedly close Thursday night, according to NFL Network’s Ian Rapoport, then fell through because Brown wouldn’t commit to reporting to the Bills. The whole ordeal has dragged on since the end of last season, so it’s fitting it had some more messy twists and turns before it was done. But apparently Brown is OK with this trade. Brown’s fit on the Raiders is obvious considering he single-handedly hauled in six more touchdowns than every Raiders wide receiver last year, 15 to 9. The Raiders gave up their previous No. 1 receiver in Amari Cooper for a first-round pick during last season. Now, they get one of football’s top receiving talents, albeit one that is six years older than Cooper. It’s hard to see going from Ben Roethlisberger to Derek Carr or whatever quarterback the Raiders might bring in as anything but a downgrade, though Brown expressed his enthusiasm to play with Carr once news of the trade broke. The feeling was unsurprisingly mutual from Carr. The problem for the Steelers-Bills trade, it seems, is that the Steelers miscalculated Brown’s ability to control where he went. Just like Pittsburgh was blindsided when Le’Veon Bell made the predictable move of holding out last season, the Steelers didn’t seem to realize that Brown could threaten to not report. Given Brown’s behavior this offseason, no team would want to risk calling his bluff and send picks to the Steelers just to have Brown stand them up. So Brown ended up with some say over where he went. Apparently, heading to Oakland was better than Buffalo. Brown also leaves an unpleasant parting gift for Pittsburgh: possibly the biggest dead money charge in NFL history. Antonio Brown is gone from Pittsburgh, but not forgotten. Brown will leave the Steelers with a dead-money salary-cap charge of over $21 million this season, thought to be the biggest one-year salary-cap charge in NFL history. That’s rough for the Steelers, but it was the price the team needed to pay to end a humiliating saga. Now that the Brown-Steelers drama is finally over (it is … right? ), let’s recap how we got here. Brown got in a dispute with Roethlisberger the Wednesday before a Week 17 game. Brown then skipped out on practices and meetings and was benched for the must-win game against the Bengals by coach Mike Tomlin. Steelers owner Dan Rooney II said he couldn’t envision Brown being with the team by the time training camp came around. Brown requested a trade. Brown and Rooney met, took a smiling picture together for social media, but decided it was best to part ways. The Steelers insisted they wouldn’t give Brown away in a trade, though the market for Brown seemed to develop slowly. 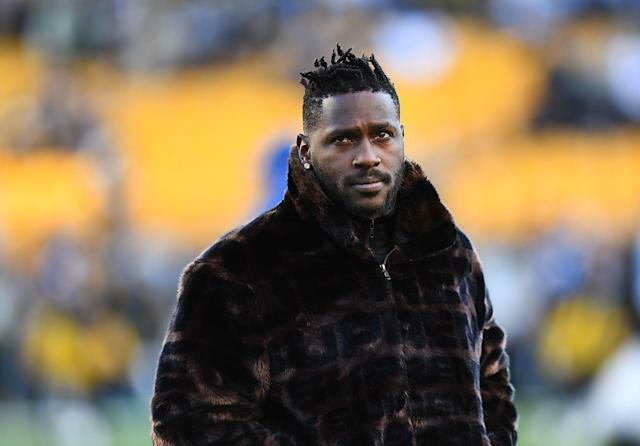 Brown’s offseason antics, including calling out Roethlisberger, making a surprise appearance on “The Masked Singer,” dying his mustache blond and giving himself the “Mr. Big Chest” nickname among his odd social media messages, might not have helped entice trade partners. Then came the fiasco with the Bills trade that died. It’s all over now. At least for the time being. With Brown, Jon Gruden and everything else in Oakland, the next wave of drama probably isn’t too far off.